When surf on the internet, you can always see people are asking for help with the problem "all my bookmarks are gone from Safari on iPhone". It’s normal to see Safari bookmarks disappeared from iPhone when you use your iPhone, trying to search something. 1. Many people say their bookmarks are gone from Safari on iPhone after an update. 2. iPhone favorites disappeared sometimes because of iCloud sync failure. 3. Safari favorites on iPhone deleted after reset iPhone to factory settings. 4. Latest Safari favorites are removed while restoring iPhone with iTunes or iCloud backup. 5. Accidentally deletion without any notice. No matter how to lost or delete Safari bookmarks on your iPhone, you must be worried because some of them might be very important for you and you never remembered the exact website address. In this case, you just want to learn how to recover deleted favorites from Safari on iPhone. In the following, I'm going to talk about the 5 ways for iPhone Safari bookmark recovery. Step 1. Go to Settings > General > Reset, select "Erase all content and settings." Step 2. After then, tap Restore from iCloud Backup, then sign in to iCloud. Step 3. 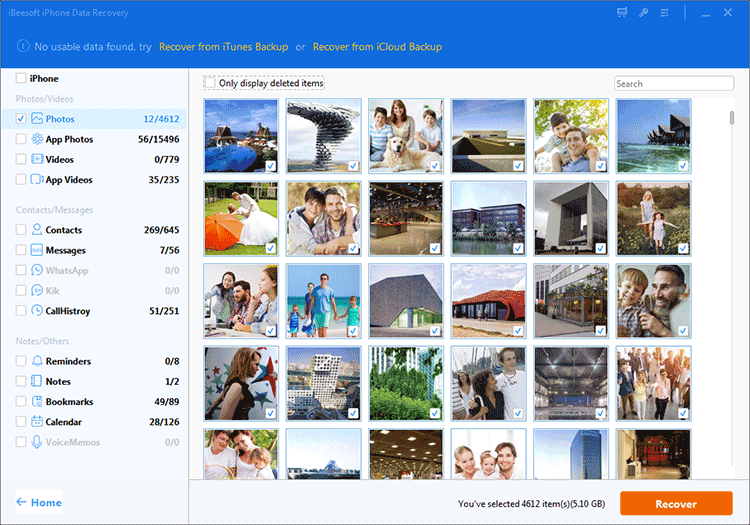 Choose the iCloud backup file which contains the Safari favorites on iPhone. Cons: it might cause the latest important data on your iPhone being overwritten by the iCloud backup file if the iCloud backup file was created a long time ago. Step 1. connect your iPhone with your computer and please make sure you’ve installed the latest iTunes on the computer. When there is a reminder on your iPhone, you need to tap the "Trust the Computer" button, letting iTunes detect your iPhone first. Step 2. 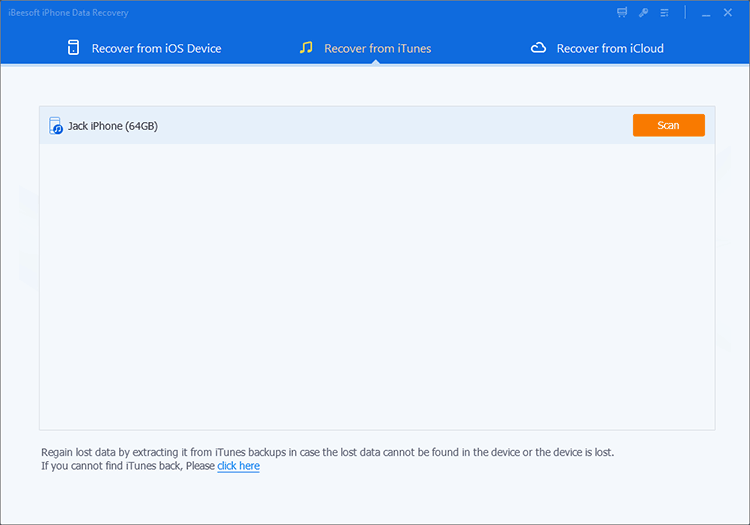 Launch iTunes and from the Summary tab, select "Restore Backup". Cons: the currently existing data on your iPhone will be replaced by the content in the iTunes backup file. It is risky as well if there are some important data there. Step 1. Click the download button to download and install the iBeesoft iPhone Data Recovery. It is fully compatible with your computer and all versions of iPhone. Step 2.Connect your iPhone with your computer and launch the software. From the main window, click "Recover from iOS". When your iPhone is detected, click "Scan". Step 3. It might take a few minutes for the data recovery software to scan all files on your iPhone. After then, you can see it sorted all files into categories. Please filter out the Safari bookmarks and preview them. When finding the target ones, check them and click "Recover" to save them on your computer. As I have mentioned in method #1, it will erase all data on your iPhone by restoring iPhone with an iCloud backup file. What if we extract Safari bookmarks from the iCloud Backup file? It’s safe and efficient, which means you can only select the files you want. Step 1. Click the download button to download and install the iBeesoft iPhone Data Recovery. It is the tool we need to extract the iCloud backup file. Step 2. From the main window, click "Recover from iCloud". 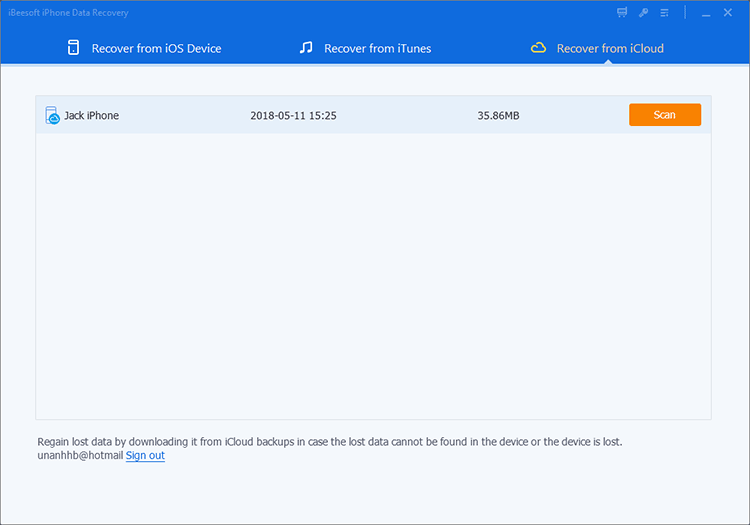 Sign in your iCloud to enable the software to detect the iCloud backup file. Select the right one and click "Scan". Step 3. After then, you can see all file types are extracted and sorted into types, listed on the left side of the software. Check out the Safari bookmarks, find the right one, click "Recover" to save them on your computer. The advantages of using the way are that it avoids data overwritten of your iPhone, which means it has no side effect to your iPhone data. Here are how to recover deleted Safari bookmarks on iPhone by extracting from iTunes backup File. Step 1. Click the download button to download and install the iBeesoft iPhone Data Recovery. After then, click "Recover from iTunes". Step 2. Select the right iTunes backup file which contains your Safari Bookmarks and click "Scan". Step 3. When it finished the scanning process, you can filter out the Safari bookmarks. Check them out, find the right one and click "Recover" to save them.